Ciaran Kilkenny and Conor McGrath got the nod. 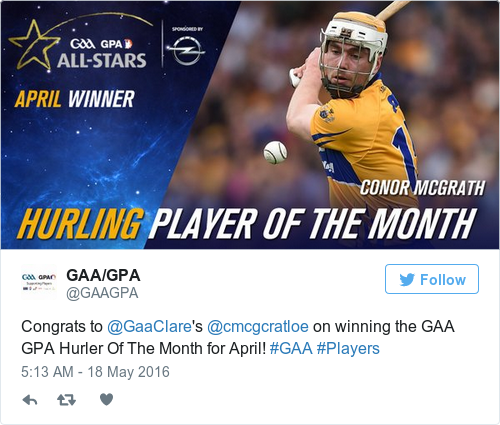 DUBLIN FOOTBALLER CIARAN Kilkenny and Clare hurler Conor McGrath have been rewarded for their playing exploits in the month of April. The pair were this morning named the GAA-GPA Opel Player of the Month winners for April. Kilkenny saw off fellow nominees Darran O’Sullivan (Kerry) and Conor McManus (Monaghan) to win the football award. The Castleknock club man struck 0-3 in Dublin’s league semi-final over Donegal and then hit 0-2 when Dublin clinched four-in-a-row with a league final win over Kerry. McGrath claimed the hurling award ahead of the Waterford duo of Shane Bennett and Austin Gleeson, who were also nominated. The Cratloe player hit 1-6 in April when they faced Kilkenny in the hurling league semi-final and had earlier chipped in with 0-2 against Tipperary at the quarter-final stage. Earlier this month he was in outstanding form when striking 0-13 in the drawn league final against Waterford and firing 0-8 in the replay victory over the Deise. 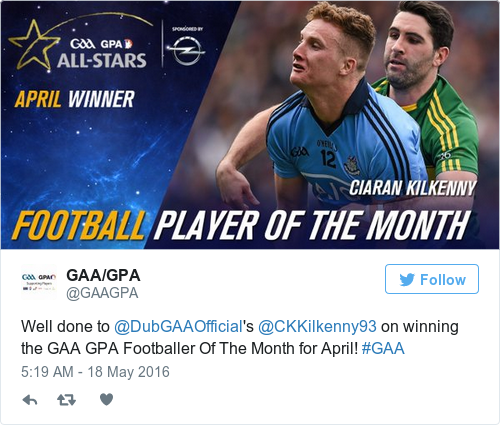 Email “Dublin and Clare forwards claim GAA player of the month awards for April”. Feedback on “Dublin and Clare forwards claim GAA player of the month awards for April”.